This Nun was present in St. Mary's Convent in October 15, 1972 when Azazel identified it as a portal to Lucifer's Cage. Lucifer speaking through the body of the dead nun. 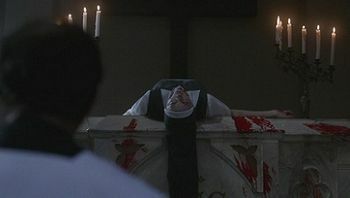 Azazel makes his presence known in the body of Father Lehne during a mass and proceeds to slaughter the nuns. After her death in the slaughter, she is used as a channel for Lucifer to communicate with Azazel. Through her, Lucifer instructs Azazel on the steps needed to release him, including the plan involving the Special Children. This page was last edited on 24 November 2017, at 07:03.